See those little square sacks on the plant and in the holes in the gear on the aquarium decoration? Guess what those are... Assassin snail eggs. There are 2 adults and a rarely seen young one in this tank, with our Betta and I picked up 3 more for another tank but it looks like we may have a bunch of little ones in the near future. I guess I've been keeping them well fed. I guess it's been a little while since I last showed my Blue Velvet tank. They are doing really well. 8 months in and the colony has really grown from the original 10 despite a few deaths and a few giveaways. At least one of the Crystal Reds likes playing in the lego tree. 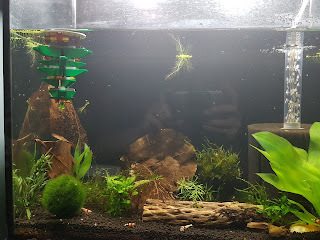 The Crystal Red Shrimp have a good old-fashioned German tanenbaum christmas tree hung upside down in their tank. Bill has some nice little snowflake lights around the outside of this tank and some gift boxes that it seems he just can't wait to see opened. ...and we've hung up a stocking for him.